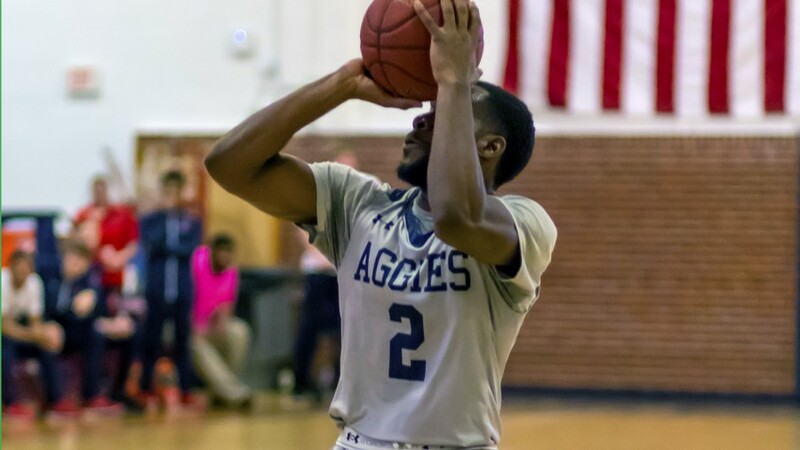 Arkadelphia, Ark.—Although the Panhandle State men's basketball team fell 97-58 in Tuesday's showing with the NCAA Division-II team, senior guard Alan Hodge Jr. rose to the occasion, scoring a game-high of 17 points against the 6-2 Great American Conference opponent. Henderson State owned a 41-28 lead at halftime, but the Aggies outshot the Reddies 5-3 from three-point range in the first half. Sophomore Hank Harrel put up two treys, along with freshman Garret Hoffman, sophomore Dillan Landers and junior Jake Murdock who each scored one from beyond the arc. Panhandle improved their overall shooting to 37.9 percent in the second half, but turnovers and work at the boards held them short of a comeback. The Aggies gave up 31 points on 22 turnovers in the game and were outmatched 45-29 at the boards; the Reddies scored 20 second-chance points and put up 58 points in the paint. Panhandle averaged 36.7 percent from the field, 31.3 percent beyond the arc and went 4 of 8 at the line. Their opponents shot at 51.3 percent for the game, landing 34.6 percent from three-point territory and went 6 of 9 in free throw attempts. Hodge led the game in scoring with 17 points, including three long-distance shots and 2 of 2 at the line. Junior Brandon Green was the next highest scoring Aggie with 11 points posted off the bench. DK Sumo and Baris Ulker led the team in rebounds with six apiece followed by Harrel and Hodge who brought down five and four boards respectively. Ulker also accounted for the Aggies' two total blocks in the game and Sumo got away with two of the teams' four steals. Panhandle State basketball enjoys a small break before re-entering Sooner Athletic Conference play on Dec. 13 when both teams face off on the road with Langston. The men's team maintains a 6-2 season record and the Aggie women stand at 5-3; both teams hold a 1-1 record within the SAC.